Asus has enjoyed plenty of press lately thanks to its Eee PC Netbook, but its range extends much further. Its G50V (£972 inc. VAT) is a powerful and well-specified HD laptop, with styling and performance ideal for gamers and multimedia users alike. Its 176-minute battery life allows for basic mobility. 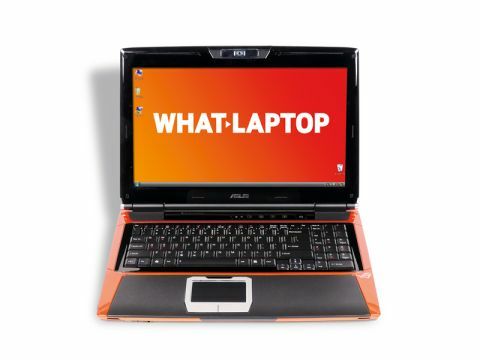 The glossy orange and black design features blue lighting effects, suiting it to gamers and more ﬂamboyant laptop owners. A near full-size keyboard and numeric keypad are ﬁtted and provide comfortable usability. The board is ﬁrmly ﬁxed, but the keys rattle as you type. The WASD keys are marked for gaming use, to improve usability when used alongside an external mouse. The 15.4-inch screen has a 16:10 aspect ratio, so isn't as well suited to watching widescreen movies as its 16:9 rivals. The screen is bright and colourful, but not as sharp as we'd have liked. As a result, images have a slightly hazy quality at times. The 1366 x 768-pixel resolution provides basic high-deﬁnition support, but is again bettered by the higher resolutions of its rivals here. HD content can be viewed in its native resolution, but doesn't look as sharp as on some rivals, so HD fans should be aware when buying. A unique feature is the use of Asus ExpressGate software. A quick-launch button lets you boot into a Linux-based operating system in just seven seconds, where you can access music and photos, and connect to the internet for web browsing and Skype use. This is also a powerful laptop. Intel's Centrino 2 technology makes light work of all ofﬁce tasks and the high-performance nVidia graphics card outperforms the Acer for impressive gaming and multimedia use. The 320GB hard drive provides strong but unexceptional data storage. Large music and HD video collections can be stored with ease. A Blu-ray drive is also in place for watching HD movies at home or on the move. You cannot write data to recordable Blu-ray discs (BD-R), but full support for recordable CDs and high-capacity dual-layer DVDs is provided, so it's easy to back up data. The power, features and style of the Asus G50V make it ideal for mobile gaming. Its screen size and resolution aren't as well suited to multimedia use as some other laptops, however, so consider your needs carefully before taking the plunge.